Snoop Dogg was a brand ambassador for Colt 45's Blast. 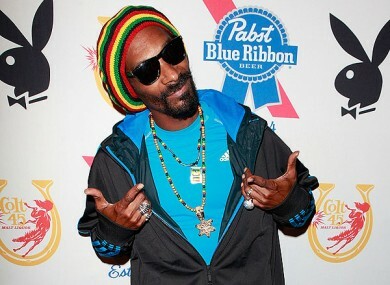 SNOOP DOGG IS suing Pabst Blue Ribbon. On Monday, the California rapper filed a suit over a deal he says entitles him a portion of the proceeds from the company’s sale last year. In 2011, Snoop Dogg signed a three-year agreement to endorse Colt 45′s fruit-flavoured malt beer Blast. PBR owned Colt 45 and launched Blast in response to the success of sweet alcoholic energy drinks like Four Loko. According to the lawsuit filed on Monday in Los Angeles Superior Court, Snoop is seeking 10% of the net sales price paid to Pabst for Blast. Last year, a group of investors bought PBR for $700 million. The lawsuit states that Snoop’s contract called for him to receive a portion of the sale price if Pabst sold its Colt 45 operations before January 2016. The lawsuit states Pabst told the rapper that the sale didn’t trigger the clause entitling him to sale proceeds. On Monday, Pabst pushed back against Snoop’s allegations. A spokesperson for the company told Business Insider that Snoop Dogg has not contacted the company about the lawsuit. “We have not been contacted by Snoop Dogg or his representatives about this issue,” PBR representative Megan Gavigan said in an email. PBR has seen a huge increase in popularity over the past six years. The 170-year-old beer has seen its sales double since 2009 as consumers grew tired of the huge marketing campaigns by the bigger beer brands. As part of his sponsorship, Snoop DJed PBR parties, played concerts hosted by the beer maker and made appearances at Blast events. Several years into his contract, Snoop also started working as an ambassador for Colt 45 itself. The brand crafted a campaign around Snoop Dogg called Keep It Colt 45. Email “Snoop Dogg is suing hipsters' favourite beer PBR for €60m”. Feedback on “Snoop Dogg is suing hipsters' favourite beer PBR for €60m”.